Recent years have been a period of transformation at Memorial Union, including within the lakefront destination’s hotel rooms. 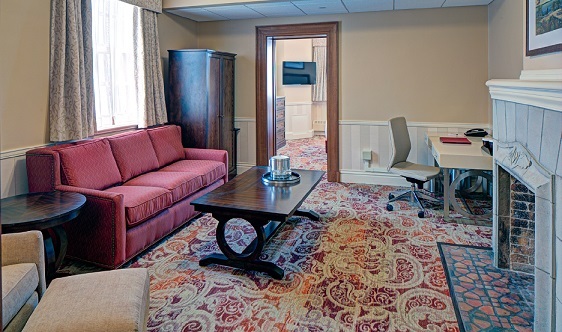 Previously known as the Memorial Union Guestrooms, the six rooms have reopened as the Wisconsin Union Club Suites. 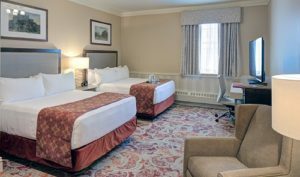 While the rooms stay true to Memorial Union’s character, they have been revamped to better suit guests’ needs and enhance comfort. The Wisconsin Union Club Suites are an original feature of Memorial Union, which opened its doors in 1928, and offer guests a unique way to experience life on campus. Nestled on the fourth floor of Memorial Union’s east wing, each luxury room is complete with dazzling views of Lake Mendota, the Memorial Union Terrace and other iconic UW-Madison landmarks. With breakfast, lunch, dinner, entertainment and the Terrace just steps away, the Club Suites have everything guests will need for an incredible UW-Madison experience. Our guests’ comfort is important to us, so we’ve made sure each room is complete with luxury bedding, custom-crafted furniture and a spa-inspired bathroom. And as the Union strives to be as environmentally friendly as possible, each bathroom is equipped with eco-friendly amenities. While enhanced for today’s guests’ needs, intricate details from the original 1928 design have been preserved, including original stone fireplaces in two suites. Since the time of its opening, esteemed guests have passed through UW-Madison’s beloved Memorial Union for lectures, performances and discussions, and we’ve commemorated a few of them by naming each suite after visitors, including Eleanor Roosevelt and Frank Lloyd Wright. Club Suites are available to Wisconsin Union members, including students; university staff and faculty; as well as guests of the university. Members can also enjoy exclusive discounts on their stays at the Suites. Reservations can be made up to 364 days in advance by calling (608) 263-2600. To find out more about staying in the Club Suites at the Wisconsin Union, watch our behind the scenes tour below, or visit our webpage. Ever wondered what it would be like to spend the night at the Union? Mark Guthier, Wisconsin Union Director, and Scott Faulkner, Hotel Manager take us on a tour of the newly renovated Wisconsin Union Club Suites at Memorial Union. Ready to book? Learn more at union.wisc.edu/hotel. If you experience issues with the video player, please click here to watch the video. Memorial Union opened in 1928. With the completion of the first full building renovation, we’re celebrating the impact of the people and programs that have made Memorial Union the living room of the UW-Madison campus for the past 90 years. With a strong tradition of student-led programming and governance, the programs that develop within these walls remain relevant to the ever-changing needs and expectations of our diverse student body. The Wisconsin Union, the organization behind the union buildings, has connected students, faculty, staff, members and visitors through shared cultural, social and recreational events and experiences since it formed in 1907. Learn more: union.wisc.edu.